Per current USAG regulations, we do NOT photograph everyone. We ONLY photograph those who sign up. By operating this way, we‘re able to photograph all events and usually get a 2nd angle on floor. Plus we‘re able to give those who sign up even more photos than most companies, usually averaging about 150-300 photos per gymnast. So if you do want photographs, you must sign up with us before your gymnast competes either online using the link below, or directly with us at the event at our desk. If you sign up early you can SAVE MONEY and TIME by not waiting in line at the event! Go to http://events.gymnasticsphoto.com/SignUp/TopFlightInvitational2018.php for information on packages and to sign up. GYMNAST GIFTS: CUSTOM LEOTARD INCLUDED FOR ALL GYMNASTS REGISTERED BY OCTOBER 1st. LATE REGISTRATIONS AFTER OCTOBER 1st will receive leotards mailed after the meet. Registrations are accepted in order received. Substitutions for gymnasts (same level ONLY) will be accepted until November 1, 2018. Substitutions for gymnast in a different level must be approved by the Meet Coordinator. Leotard sizes can not be changed after October 10th without LATE REGISTRATION FEE. 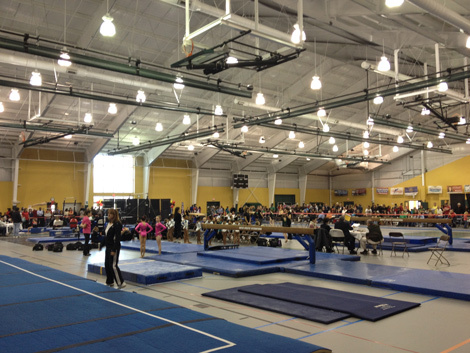 Team Photo will be available during the meet to photograph all pre-registered gymnast. More info to come. 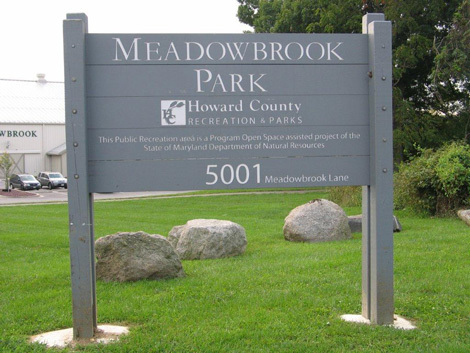 The Meadowbrook Athletic Center (the MAC) is Howard County’s newest destination for indoor basketball, volleyball, indoor soccer, in-line hockey, lacrosse, field hockey, badminton, jump rope and more! 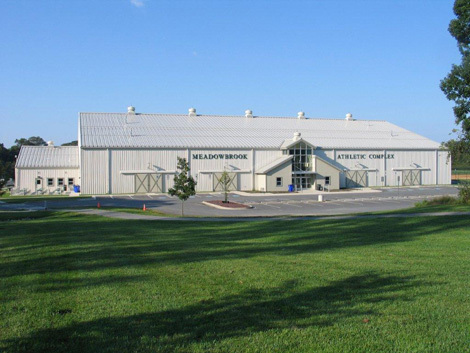 The facility houses 35,000 square feet of unobstructed gymnasium space designed to serve all ages and all levels of play. Additional parking is available in the Long Gate Park & Ride Lot which is short walk from the Meadowbrook Athletic Complex. 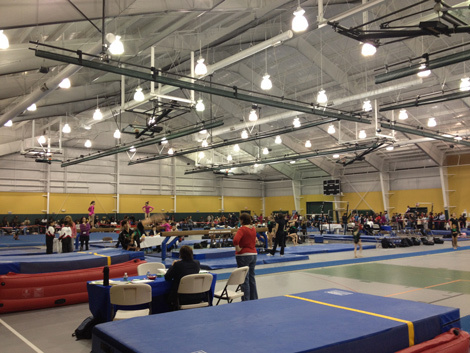 Top Flight Gymnastics offers classes for students 18 months of age through high school. The Top Flight Gymnastics Team Program wishes to allow each competitive gymnast the opportunity to excel and aspire to the greatest individual degree in the sport of gymnastics. Competitive gymnastics develops physical, mental, and emotional control which is beyond that rationally envisioned. The gymnast will develop strength, flexibility, coordination, and endurance through the program. Other benefits of competitive training are: self-satisfaction, kinesthetic awareness, a healthy body, an undaunted belief in one’s self, and a disciplined approach to one’s life. Competition is an essential part of the gymnast’s experiences in the program. Each gymnast will be involved in competition in accordance with her ability and age. The gymnast will then have the opportunity to advance in a step-by-step progression to higher competitive levels. Team members will have the opportunity for experiences that would normally not be available to them. The discipline, skills, accomplishments, and friendships will carry over in many of life’s endeavors. To foster the growth and development of each gymnast by setting realistic goals which are achievable though challenging. 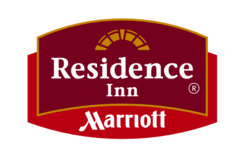 To provide opportunities for national travel through competitive experiences. To provide opportunities for a gymnast to achieve a level of proficiency that would allow him/her to receive a college scholarship. 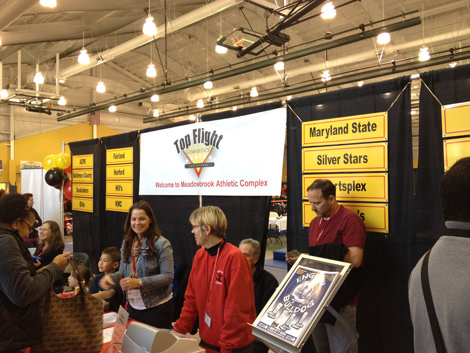 To help develop a rapport with the public which will nurture the growth of Top Flight Gymnastics Center, Inc.